Kienbock's disease is a condition that results in the collapse of the lunate bone in your wrist. This results in pain and decreased mobility. Kienbock's disease surgery can restore your mobility and reduce your pain. Your wrist is a small but complex joint, helping your hand with both mobility and strength. This eight-bone joint aids with everything from grips to throws to waves. So when one of the bones in your wrist is injured, the pain and limitation can be felt in many of your everyday motions. Are there non-surgical treatments for Kienbock’s disease? In Kienbock’s disease the lunate bone loses its blood supply, gradually killing the bone. This has big ramifications for your hand, because this particular bone plays a big role in your mobility. The lunate works with bones in your forearm to direct your wrist’s motion. People who suffer from Kienbock’s, which is most popular among young adult men, can experience pain and stiffness as a result of the disease. If not treated, the lunate bone can collapse in your wrist. That leads to irritation, as the bone rubs unnaturally against your wrist tendons. The collapse of the lunate bone causes the other seven bones in your wrist to support the joint, which can lead to further problems. 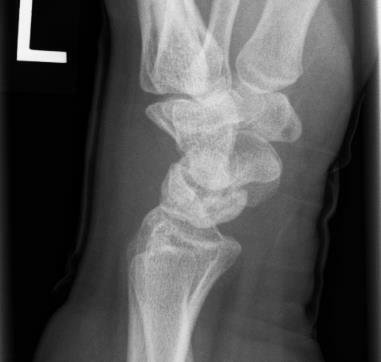 X-ray of the left hand of a patient with Kienbock’s disease. The other wrist bones have been displaced by the collapse of the lunate bone. We understand how Kienbock’s disease develops, yet there is no consensus as to why it happens. That said, we know that a few traits are common among those with the ailment. For example, a lot of people with Kienbock’s already had a wrist injury like a sprain or ongoing pressure. With others who have Kienbock’s, there is a common pattern of disproportionate bones in the forearm. The imbalanced length of these forearm bones puts stress on the wrist joint. Others with Kienbock’s had prior blood supply issues, possibly from blood vessel injuries. How do you know if you have Kienbock’s? The common symptoms are pain and limited motion in your wrist. The pain can be severe or mild, and constant or occasional. For many with Kienbock’s, discomfort might occur only after intense motion. You may have the disease for years before the tenderness in your wrist becomes severe. Your lunate bone has lost its supply of blood. The bone may already be fractured. Your bone turns has hardened because of its inability to receive blood. Your bone has collapsed. It may have slipped within your wrist, putting the other tendons and bones in your wrist at risk of grinding and irritation. The collapsed bone may be in multiple pieces now scattered throughout your wrist. Your bone has not only collapsed but also injured other sections of your wrist, whether tendons or bones. You may have arthritis in your wrist as a result of the bone shards and their inflicted damage. Are there non-surgical treatment for Kienbock’s disease? The course of your treatment depends on the stage of your Kienbock’s as well as your age and lifestyle. If your case of Kienbock’s is in its early stages, then your doctor may want to merely immobilize your wrist or send you to physical therapy. This does not rid you of Kienbock’s, but it may slow the progression of the disease. Alternately, your doctor might suggest a wait-and-see approach, observing your wrist over time with repeated imaging studies, to monitor the rate of degeneration. Along with non-surgical options, you have surgical options available for Kienbock’s in any stage. A common procedure for people with early-stage Kienbock’s is revascularization. This involves your surgeon sliding blood vessels from another part of your wrist over to your lunate. With this surgery, the goal is to get blood flow back to the entire bone. This allows the bone to heal over time. If your Kienbock’s comes from uneven bones in your forearm, then your surgeon might perform a joint leveling procedure. By lengthening or shortening a forearm bone, your surgeon puts your forearm bones at a healthy ratio to one another. Afterward, they no longer put pressure on your wrist. This surgery involves removing the problematic bone from your wrist. One concern from this procedure is that other bones will slip into the void left by the missing lunate bone. To prevent this setback and keep all bones aligned, your surgeon may set an artificial bone in the place of your removed lunate. Another surgical method for Kienbock’s, especially in its late stages, is to join the lunate to an adjacent bone, the carpal. Sometimes this procedure is combined with revascularization — your surgeon will slide blood vessels from other parts of your arm to your lunate bone. In severe fourth-stage cases of Kienbock’s, your collapsed lunate bone may be creating arthritis throughout your wrist. So your surgeon will remove four of the eight bones in your wrist joint, clearing room for your wrist to regain mobility. You may, however, lose some wrist strength as a result of the procedure. If you think that you or a loved one may be suffering from Kienbock’s disease, MSS can help. We have a very experienced team of hand surgeons in Metro Detroit. We can help diagnose and treat Kienbock’s disease and other common conditions. Request an appointment today!